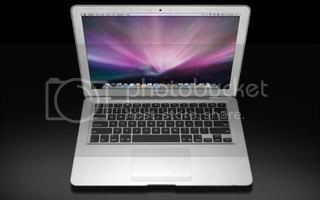 Today at MacWorld's annual conference Steve Jobs announced the release of the New MacBook Air. Touted as thin as air. The thinness of MacBook, Air is stunning. But perhaps more impressive, there’s a full-size notebook encased in the 0.16 to 0.76 inch of sleek, sturdy anodized aluminum. And at just 3.0 pounds, MacBook Air is more than portable — it’s with you everywhere you go. MacBook Air is nearly as thin as your index finger. Practically every detail that could be streamlined has been. Yet it still has a 13.3-inch widescreen LED display, full-size keyboard, and large multi-touch trackpad. It’s incomparably portable without the usual ultra-portable screen and keyboard compromises. The Internet has been buzzing about the Air for some time know. Some comments have been pessimistic , but most are optimistic. The incredible thinness of MacBook Air is the result of numerous size- and weight-shaving innovations. From a slimmer hard drive to strategically hidden I/O ports to a lower-profile battery, everything has been considered and reconsidered with thinness in mind. The New Mac OS Leopard Software was also released recently. Along with the new Mac OS Leopard Operating system installed the Air should be one powerful portable Laptop for a long time coming. Features 802.11-N Wi-Fi and 2.1 EDF BlueTooth. You won't find a optical drive on the Air Though. All The downloading of Movies,Files and Software are done online. Its not needed. Wirelessly download movies from iTunes, Most of us put music on our iPods to take with us in our cars. Back up files with Time Capsule. Use the powerful Remote Disk Feature to connect to any Mac or PC to download all your Software. when you click on Remote Disk you will see all the Macs and PC in range, then simply ask to use the optical drive of one of the PCs or Mac in the menu. Then wirelessly download what you need. What a concept. No more disks . 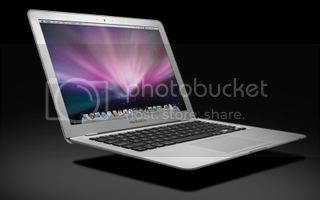 The MacBook Air will surly be life changing for laptop users. Leave the cables at home. Looks like Steve Jobs and Apple have a winner here. Get your MacBook Air Here. Be the first to to be blazing the Internet with the newest innovation from Apple.